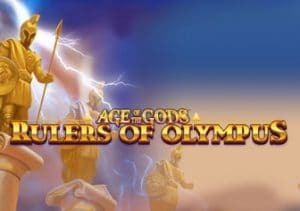 The latest instalment of Greek myth-themed action from Playtech is Age of the Gods: Rulers of Olympus. Zeus and Hera are the stars of this 5 reel, 25 payline video slot which comes with cracking design and a good range of extras. Keep an eye out for Zeus who can fling up to 7 wilds onto the reels on any spin. Look out too for shifting wilds, 2 free spins rounds and potentially progressive jackpot prizes. Play on all devices from 25p to £500 per spin. Like the other video slots in the Age of the Gods series, the design in Age of the Gods: Rulers of Olympus is done comic style and very impressive. Joining the Greek style playing card values are an assortment of Greek gods and goddesses. The best of the payers are Zeus and Hera. Land 5 of these on a payline and you’ll win a payout of 40 times your total bet. Thunderbolt Bonus feature – landing the Bonus symbol on reel 5 stirs an angry Zeus into life. He flings thunderbolts onto the reels and in the process turns up to 7 symbol positions wild. A new payout follows with the wild in position. Hera vs Zeus Shifting Wilds feature – this bonus can trigger at random on any spin. Look out as Zeus and Hera shift 1 position to the left and right respectively with each spin. If they both land on the same space the Battle for Power Free Games feature goes live. Battle For Power Free Games feature – Hera and Zeus go into battle in this round whenever they land on the same row. The free spins continue until Zeus is defeated. Olympus Free Games feature – you’ll receive 7 free spins when you hit the Olympus Free Games Bonus symbol on reel 5. These are played on a new 50 payline reel set. Up to 10 Zeus symbols will be locked to reels for every free spin during this round. You’ll also have a chance to win a potentially bumper progressive prise as Age of the Gods: Rulers of Olympus is part of the Age of the Gods Jackpot Network. The jackpot round can strike at random on any spin. Then choose from the gold coins and hopefully land a big jackpot prize. It’s a case of ‘if it ain’t broke, don’t fix’ it for Playtech here. The developer has kept to its tried and tested formula. The design is as classy as usual and there’s enough going on with the features to keep things moving along nicely. If you’ve enjoyed the previous instalments in this series, then Age of the Gods: Rulers of Olympus should offer plenty of appeal. I would also recommend Age of the Gods: Fate Sisters which is often overlooked.